Western bean cutworm (WBCW) was historically found in the western Corn Belt, where it was a common pest of dry beans and a sporadic pest of corn. Starting in the year 2000, economic damage from this pest was found on corn in Iowa and Minnesota. Since then, this pest has continued to rapidly spread eastward, reaching Ohio in 2006. The easiest way to monitor the presence of this pest is trapping of the adult moths. In 2006, 3 adults were caught, 6 in 2007, 150 in 2008, and over 500 in 2009. Most moths have been caught in the extreme northwest or west central portion of Ohio. It should be pointed out that these trap count numbers are still considered low compared with states to the west of Ohio where larval infestations do occur. The adults (fig. 1) emerge in late June–early July after fully grown larvae overwinter inside soil chambers in the soil 3–8 inches deep. The adults are mostly dark brown and black, with three characteristic markings that distinguish them from other moths: (1) a white stripe on the top edge of the forewing, (2) a light brown-tan colored dot, and (3) a comma or crescent-shaped mark behind the dot. Mid-flight of the adults usually occurs in mid-July, with adult flight ending by mid- to late August. There is one generation per year. During the summer flights, adults mate, and females lay eggs on the uppermost portion of the flag leaf. Eggs are laid in unevenly distributed clusters of 5–200, but averaging about 50 per cluster, and hatch within 5–7 days. Eggs first appear white, then tan and then a dark royal purple (fig. 2). Once eggs turn purple, hatching should occur within 24 hours. Figure 1. Western bean cutworm adult. Photo by R. Hammond. Figure 2. Western bean cutworm eggs. Photo by M. Rice. Larvae are tan in color, and can be identified by two broad stripes immediately behind the head (fig. 3). Other characteristics of WBCW larvae are absence of microspines on the body (unlike corn earworm) and lack of net-like marks on the head capsule (unlike corn earworm larvae). In pre-tassel corn, larvae will move to the whorl to feed on the flag leaf and unemerged tassel. Once the tassel emerges, larvae then move to the ear, while feeding on corn pollen, leaf tissue, and silks. By the 4th instar, larvae will enter the ear through the tip, or by chewing through the side of the husk and feeding directly on the kernels (fig. 4). Unlike corn earworm, WBCW are not cannibalistic, and burrowing behavior may be caused by overcrowding at the ear tip. The presence of these burrows also makes the ear more prone to fungal and mycotoxin infection. By the 6th or 7th instar, larvae emerge from the ear and fall to the ground to overwinter in soil chambers. Pupation occurs in May, immediately before adult emergence. Figure 3. Western bean cutworm larvae. Photo by R. Hammond. Figure 4. Western bean cutworm larvae damage. Photo by R. Hammond. Figure 5. Corn fields can be monitored through pheromone traps. The trap above is made from an empty gallon milk jug. Photo by R. Hammond. There is some evidence from Nebraska that females prefer to lay eggs in pre-tassel corn. Nevertheless, all corn is susceptible to infestation, and areas differing in growth stage should be monitored and, if adults are found, inspected. Corn fields can be easily monitored through simple pheromone traps. Four windows from an empty gallon milk jug are cut, and the jug is tied to a post at least 4 feet high (fig. 5). A bent paper clip is used to attach the lure to the inside lid of the milk jug and the cap is replaced to keep the lure in place. The bottom of the jug is filled with an 4:1; water:antifreeze solution, with a drop of dish soap added. Traps are placed on the edge of a cornfield; one trap per field is sufficient. Traps should be inspected at least weekly. When the first adult is collected or when adults are collected on consecutive nights, scouting for eggs or larvae should begin. Lures can be purchased at either Great Lakes IPM, 10220 Church RD NE, Vestaburg, MI 48891, or at Gempler's, P.O. Box 270, 211 Blue Mounds Road, Mt. Horeb, WI 53572. You can also contact your local Extension office for assistance. To scout for eggs or larvae, choose at least 20 consecutive plants in 5 random locations and inspect the uppermost 3–4 leaves for eggs, as well as the silks for larvae if tassel has emerged. Be sure to inspect different areas of the field that may be in different growth stages. 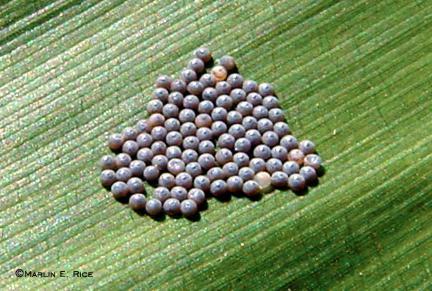 For field corn, if 8% or more of the plants inspected have eggs or larvae, consider treatment. For sweet corn, consider treatment if eggs or larvae are found on >4% of plants for the processing market or on >1% of plants for fresh-market. While no eggs have been reported from WBCW in Ohio, a single larva and a single injured ear of corn were found in 2009 in the state. However, economic damage has been reported in Indiana and Michigan, states to the west and north of Ohio, respectively. Ontario is also reporting large adult collections for the first time. For now, scouting remains the growers' best tool for managing WBCW. If infestations exceed threshold, many insecticides are available to adequately control WBCW. However, as with any ear-burrowing Lepidopteran pest, timing is critical. Insecticide applications must occur after egg hatch, or after tassel emergence, but before larvae enter the ear. If eggs have hatched, applications should be made after 95% of the field has tassel. If eggs have not hatched, monitor for the color change. Hatch will occur within 24–48 hours once eggs turn purple. To search for larval injury after it has occurred, growers can search the corn for ears having feeding holes on the outside of the husks. There is a video available on the Agronomic Crops Insects website (entomology.osu.edu/ag) that details how and what to look for. WBCW can be controlled with transgenic hybrids. However, only transgenic hybrids with the Cry1F gene will offer adequate to near-complete control of WBCW. These include Herculex I and Herculex Xtra, as well as SmartStax, which will be coming soon into commercialization. Additionally, a new gene, Vip3A from Syngenta, should be available in either 2010 or 2011, which will also offer control of WBCW. With any of these transgenics that offer WBCW control, remember that the refuge that should be planted to hybrids without the gene will require watching because those hybrids will not offer management of the insect. The ‘Attribute' sweet corn hybrids, which are the only BT sweet corn hybrids currently available, will not control WBCW. See Ohio State University Extension Bulletin 545, Control of Insect Pests of Field Crops, for those insecticides labeled for insecticides labeled on corn. Bulletin 545 can be accessed at entomology.osu.edu/ag. For sweet corn, pyrethroids (Warrior, Capture, Brigade, Baythroid, Mustang Max, Asana, Pounce), encapsulated methyl parathion (Penncap-M), or carbaryl (Sevin) can be used for control of WBCW.